Meet Little Pim, a charming animated panda who guides babies, toddlers and preschoolers on a fun-filled journey to learning a foreign language. Little Pim only speaks in the foreign language, while interacting with babies and young children enjoying everyday activities. Because Little Pim focuses on the first words typically acquired in a kid�s vocabulary, your family can reinforce the lessons by simply repeating the new language during your everyday routines. 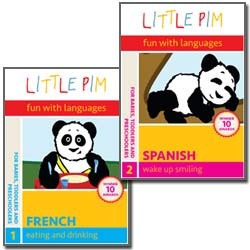 Created by Julia Pimsleur Levine, an award-winning filmmaker and mom, Little Pim is a groundbreaking kids� language DVD series that offers hours of fun while providing the basic building blocks for learning a foreign language. This multi-disc series of 35-minute DVDs can be viewed in any order, with each DVD teaching 60 words of vocabulary.Each program is available individually or in a discounted three-disc set, for Spanish, French, Chinese, Italian, Japanese, Hebrew, English (ESL), German, Arabic, and Russian. Special: $25% off! Was $75, now for $55! Watch Little Pim with your little one and repeat the words together � it's fun for kids and adults! The more you interact with the language, the easier the lessons become and the more your child will learn. You do not need to know the language your child is learning to watch with them; we have provided optional English subtitles (select Subtitles in the start up menu) so you can easily follow along.